USANA, word! 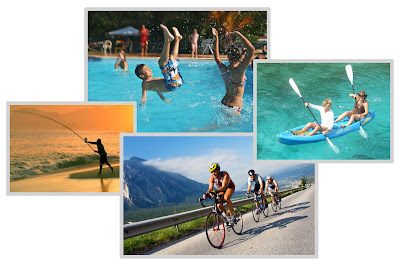 : Get outdoors – great for your mind, body and soul! Get outdoors – great for your mind, body and soul! Summer’s nearly over but it’s still a great time to get out and about and enjoy the fresh air. Pick a sport or an activity that you love, and you could feel happier, healthier and more energised! When you exercise, your body releases endorphins, feel-good chemicals that lift your mood. Aerobic exercise burns calories (but you need to exercise fast enough to be a little out of breath yet just about able to hold a conversation) so try to fit in at least half an hour of exercise on most days. Combine this with resistance training (training with weights) and over time, it may also help you to feel more confident about yourself as you firm up, tone up and shift some extra kilos. Try team sports, cycling, swimming or the gym. Or grab the kids’ skipping rope and jump to it! It’s hard work but it’s worth it. Get an exercise buddy on board. Whether you want a friend to join you and get fit with you or you just want to hear some positive encouragement, buddies helps to keep you on track towards your fitness goals! But a little sun is an important source of bone-building vitamin D. It’s made by the action of sunlight on your skin (you can also get some from foods such as fortified cereals and oily fish). So, try an early morning or an evening walk without sunscreen to boost your vitamin D levels. Vitamin D can be surprisingly low in some people. For example, if you are dark skinned (the pigment melanin can interfere with the reaction of sunlight on your skin) are elderly or housebound, if you cover your skin for cultural reasons or you have osteoporosis, your doctor may recommend a vitamin D supplement. Getting out in the sunshine encourages your body to produce serotonin, a hormone which regulates your normal sleep-wake cycle, too. So, by getting a little daily sunshine and exercising outdoors, you could sleep more soundly too. Exercise regularly and you’ll boost your muscle strength and your stamina. Your body will become more efficient at delivering vital oxygen and nutrients to your system helping your heart and lungs work more efficiently. In turn, this means you’ll have more energy for daily activities. Try setting the alarm clock to go off half an hour earlier so you can fit in a brisk walk or a cycle. Early morning exercise can even help you start the day feeling more in control. Don’t leave exercise too late in the day – this could actually keep you awake and disrupt your sleep patterns! Remember, if you haven’t exercised for some time or if you are being treated by a medical condition, check with your doctor before you start an exercise program.